While still echoing the naturalism of the Gupta period, the more generalised forms of this fine, although much worn, little stele suggest a date c.700 A.D. The victorious goddess steps triumphantly on the head of the demon-buffalo, whose upraised rump, vigorously curved, suggests his now vanquished mighty power, while the way his left front leg is twisted back and the downturned mouth convey the pain and misery of his downfall. 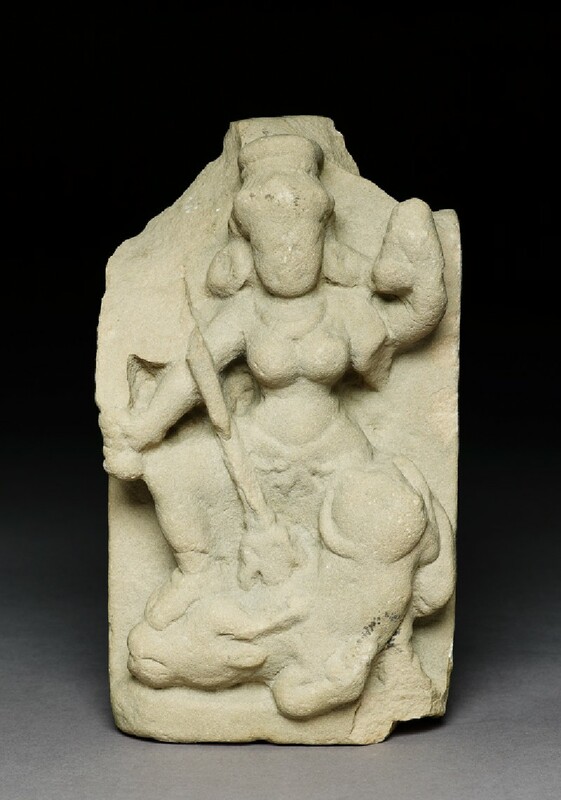 The goddess, pushing her trident into the animal’s back with one of her hands, is perfectly balanced, as is the whole composition of the group. The myth of Durgā (like Kālī, one of the terrible or combatant forms of the Goddess) killing Mahisa, an asura or demon in the form of a buffalo, is one of the most commonly represented in Indian art. The incident is first described in detail in the Devī-Māhātmya, a later addition to the Mārkaṇḍeya-Purāṇa. Mahisa was causing such terror and consternation amongst the gods that Śiva created a surrogate, Durgā, to slay the monster, each of the gods bestowing upon her their several powers, symbolised inconographically by their weapons. The trident, for instance is Śiva’s weapon par excellence. 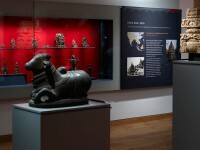 Along with small figures of Vāsudeva [see EAOS.38.a), little stele figuring Durgā killing the buffalo, also of small size, like [EAOS.77] in the Museum’s collection, all carved in Mathura during the Kuṣāṇa period, are the first Hindu images to be made in large numbers. In these early images, the goddess stands, usually straight-legged, behind the buffalo, with one stiff right arm pressing down on his back which he rears up, with his hand pressed against the goddess’s left shoulder. Then, probably at some time in the 5th century, this icnonographic formula is drastically altered. The position of the buffalo is reversed (as here), with his head held down by Durgā’s right foot and his rump raised on her left hand side. This arrangement prevails henceforth in northern India and parts of the Deccan.